LOS ANGELES (AP) — The University of Southern California on Wednesday announced a new school president to usher “a new era” following a series of high-profile scandals that culminated last week with a massive college admissions bribery case. Carol Folt, former chancellor of the University of North Carolina at Chapel Hill, will become USC’s 12th president and the first permanent female president in school history — an announcement that came a week after news of the bribery scandal broke. 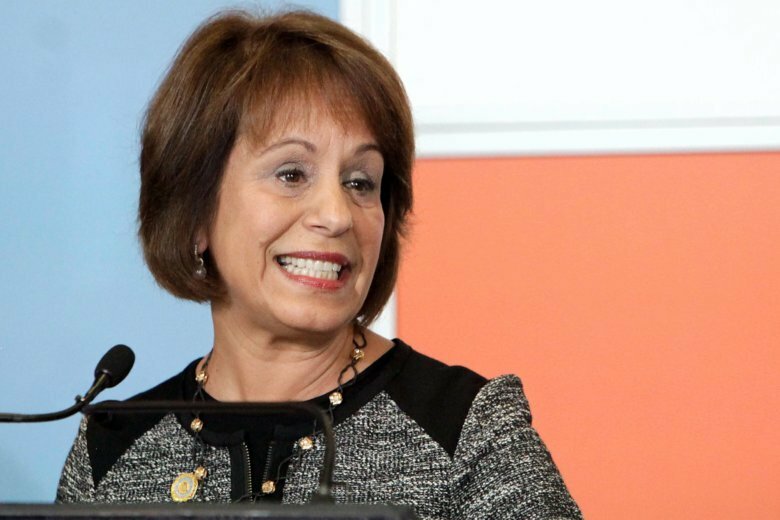 Folt said the scandal didn’t give her pause about taking on the job. Folt said she was horrified to learn of the scheme, which involved wealthy parents paying bribes to have a college counselor rig standardized tests or get their children admitted as recruits of sports they didn’t play. Rick Caruso, chairman of the USC board of trustees, said problems will occur, but the measure of great leadership is how one reacts to them. A lengthy search for a new president led a 23-member committee to unanimously recommend Folt, Caruso said. Folt will take over USC from interim President Wanda Austin, who stepped in after former President C.L. Max Nikias resigned last summer amid two major controversies: reports that the school ignored complaints of widespread sexual misconduct by a longtime campus gynecologist and an investigation into a medical school dean accused of smoking methamphetamine with a woman who overdosed. Combined with the bribery scandal, Folt will have her work cut out for her, said Roger Sloboda, a Dartmouth biology professor who worked with Folt at the New Hampshire school, where she started her academic career and spent three decades. From a crisis standpoint at her previous job at UNC-Chapel Hill, Folt did just OK, said Jay Schalin, policy analysis director at the James G. Martin Center for Academic Renewal, a right-leaning think tank. At UNC, Folt inherited a department that offered irregular courses with significant athlete enrollments dating back years before her arrival. The courses were misidentified as lecture classes that didn’t meet, required a research paper or two for typically high grades with little to no faculty oversight. Folt also was forced out early from the job in January amid a controversy over a Confederate statue known as “Silent Sam” that was torn down on campus. Schalin said Folt angered conservatives in North Carolina with “mixed signals” on Silent Sam that they felt emboldened protesters. As far the academic scandal involving UNC athletes, he said the USC scandal seems smaller in scope. “Folt should have little trouble managing it, unless the media goes after USC in a major way,” he said. “Carol Folt is a very accomplished and highly respected higher education leader,” association President Peter McPherson said in a statement. Four USC students showed up to Folt’s introduction at USC protesting her actions during the Confederate statue controversy, saying she took credit for taking it down when it really was a student-led movement. One of the students, Rebecca Hu, said she wanted to make her concerns known and felt students should have been more heavily involved in the selection of a new president. “I think the student community is really hurt by everyone in USC administration, and we just want to make sure they actually hear us for once and take us seriously,” said Hu, a senior majoring in philosophy. Jason Chang, a 20-year-old accounting major, said he and his fellow students “just want transparency” about the unfolding scandal. “It’s sad to say that it’s tainting the school’s reputation,” he said. Graduate student Myla Bastien also called for transparency and honesty. “I think that if USC just owns it, and then comes up with a plan to prevent it from happening in the future, that would be helpful,” she said. Associated Press writers Christopher Weber and John Antczak in Los Angeles, Jonathan Drew in Raleigh, North Carolina, and Jocelyn Gecker in San Francisco contributed to this report.